Another year in SEO has come and gone and it's time to look back at the stories that helped shape the industry in 2017. From algorithm update bombshells to ever-morphing ad abilities and a hint of mobile-first madness, 2017 definitely had a flavor all of its own. Still, many of the stories that defined the year flew well under the radar but were nonetheless significant. I'll definitely be covering those as well the sizzlingly sensational stories of 2017. I could spend all day on 2017's Google algorithm updates. However, to spare your eyes and my fingers, let's say we just focus on the more dramatic updates of 2017 (see our Google update timeline for a full list of Google's updates in 2017). Before I jump into the thick of it, I want to point out that rank is increasingly becoming more volatile due to RankBrain. While the updates I am about to point out are of the more sensational nature, I don't feel that they adequately portray what's really going on out there (despite everyone's obsession with the notably notorious updates I shall soon allude to). Caveats aside, here we go. Officially, the mobile interstitial penalty went live on January 10, 2017. 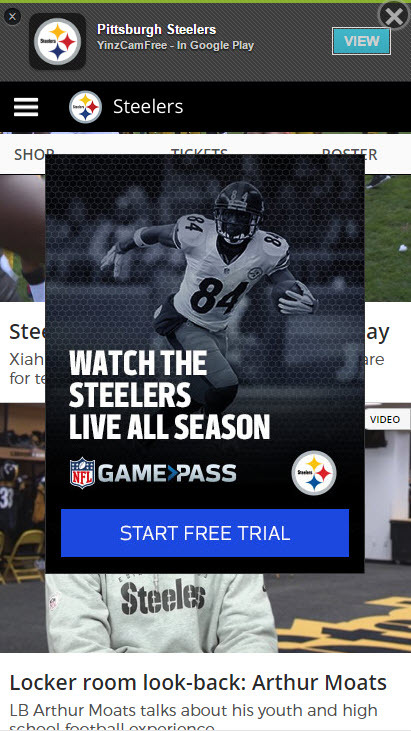 The penalty is meant to demote mobile sites that utilize that large, pesky ad overlay which generally includes the smallest x on the planet. It's not to say that the penalty does not do this, but the industry has almost universally noted little impact as a result of it. That is, sites still employ the annoying ad format and there has not been much in the way of penalties, at least to our knowledge. Fred was a major SEO story in 2017. From the origins of its name (a story for another time) to the total uproar it caused, Fred just may be the first update to have an "etheric" persona. Hoopla aside, Fred came to the center ring back in early March and was a prolonged update targeting low quality sites with an emphasis on over-advertisement. At the time, it was madness, we just could not stop talking about Fred for weeks, bordering on months. I'm sorry, I just have to do this... Willllllllllmaaaaaaaa! Starting circa May 15th, Google unleashed an update that initially didn't generate a lot of buzz, but was a ranking force to be reckoned with. There was early speculation that the ranking shifts were due to Google removing the URL that appeared within a Featured Snippet from the organic results. We found though that this Google test only impacted 4.5% of all Featured Snippets, not enough to have a deep impact. We did find that some of the biggest names in retail were hit as a result of the Google algorithm update. Less than a month after the Mid-May Google update, our Rank Risk Index caught the longest update roll-out we ever tracked. Lasting a whopping 10 days, this update was elusive to our best attempts at pinning it down. Not willing to accept defeat, we found that the update most heavily impacted the 6 through 10 slots on the SERP. Across all of the niches we looked at, the pattern held up, Google, while increasing fluctuations between the 1st through 5th positions, had heavily targeted sites towards the bottom half of page one. On October 27, 2017 Google restricted access to country-specific search results by nullifying the use of a specific Google ccTLD. (Don't worry, you don't need a VPN, there is a workaround). Now, you might say that this doesn't qualify as an algorithm update. But indeed it does. Only a significant algorithm adjustment could hyper-localize the SERP. As testimony, we saw some of the most unstable SERP feature data trends we've tracked to date parallel Google's ccTLD policy change. Two items dominated the year in mobile SEO; Google's mobile-first index and AMP (of course). Watching the storylines of these two mobile elements was downright intriguing. Simply, it was a big year for AMP and perhaps an even bigger one for the mobile-first index. When you look back at what went down with the mobile-first index this past year, it's just amazing. You don't have to look hard to have your mind blown. In fact, all you need to do is look at how Google's statements on the index progressed as the year moved on. Way back in the middle of January Googler John Mueller said he didn't expect the index to launch until later in the year. Then in April, Google's Gary Illyes pushed the roll-out further down the road, saying that the chances of a 2017 launch were pretty slim. The forecast from there just continued to get grimmer as Illyes, speaking at SMX Advanced, said that they were "probably many quarters away" from the mobile-first index's release into the wild. Another newsworthy tidbit from this latest batch of mobile-first news was the revelation that Google would communicate heavily before any roll-out, note this. Things were pretty quiet until the industry caught wind of an unannounced roll-out of the mobile-first index, without any warning or communication as promised. In late September and early October, we began seeing new and different SERP classifiers (i.e. how the HTML on the SERP was structured). Roughly 20% of the SERPs we tracked showed new classifiers, which led us to believe that the index was indeed rolling out. By October 4th, Google had confirmed that they had in fact began to push the new mobile-first index. This does seem to be in line with Google's announcement that the mobile first index would be released in batches, i.e., not all at once. Other than that, we also learned that the index would roll out at the host level (i.e., not per page) and to those already suitable for the index (i.e., sites already highly optimized for mobile) before all others. AMP is way up on Google's priority list and as such strongly continued to evolve in 2017. There is no doubt that Google is trying to offer subtle AMP incentives in the hopes that site owners will adopt the format. Of course, the jury is still out, and even in 2017 where AMP grew stronger, it has not become dominant in the way I suspect Google hopes it will eventually become. Here are some of the more significant changes we saw over the year in chronological order. To broaden AMP's reach to users on devices that utilize slower networks, Google announced AMP Lite in January 2017. Initially rolled-out to a limited number of markets, this version of AMP uses fewer bytes than the standard AMP format. In late January we tracked an incredible increase in the number of AMP results within Google's mobile Top Stories News Box. News carousels around the world saw a large infusion of AMP results, making AMP the dominant format within the mobile News Box. In early February, Google addressed a longstanding concern, publisher URLs. Being that an AMP page is cached, the URL that shows is not that of the page's publisher. This obviously did not sit well with publishers utilizing AMP. In response to these concerns, Google inserted a URL field under the actual URL. Meaning, that under the Google URL that shows for AMP pages is a header that contains access to a link that reflects the publisher's own URL. AMP made a big splash in Asia during 2017. In March it was reported that Chinese search engines Baidu and Sogou began utilizing the faster loading AMP format. This, coupled with Yahoo Japan doing the same, meant that AMP was introduced to another billion people in 2017. Fast forwarding to early September, AMP sites began appearing within mobile Featured Snippets. That is, Google began predominately pulling AMP sites into its Featured Snippets. As a result, mobile Featured Snippets may not align to desktop in cases where the desktop site's mobile page is not optimized for AMP. Just a few days after the industry found the AMP icon within mobile Featured Snippets, AMP got a paid search boost. 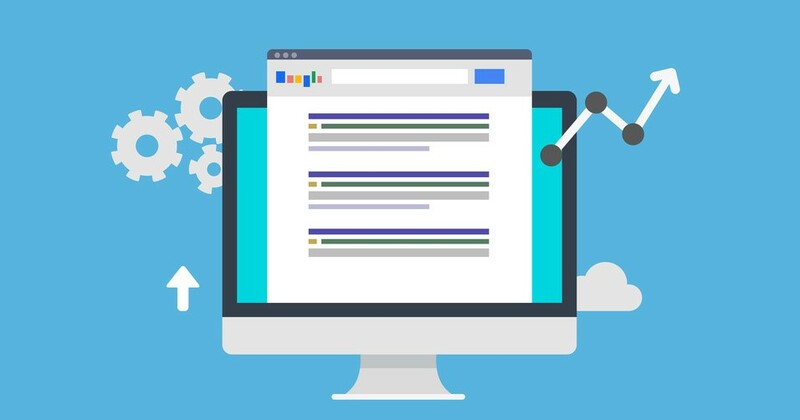 Following a May 2017 beta test, AdWords advertisers were given the ability to send site traffic from their ads to an AMP optimized landing page. As part of 2017's fall focus on all things AMP, in October Google expanded AMP's page abilities. Added to the repertoire were a responsive sidebar, scroll-bound animations, and more. Capping the year off on a less inspiring note, Google announced a new AMP related penalty. AMP pages that do not match their canonical non-AMP page, and instead show a link to the full content, are now subject to manual actions. In doing so, Google is trying to prevent site owners from using their AMP page as a teaser page, offering the full content only on the canonical non-AMP page. Year in and year out there are a massive numbers of changes made to both AdWords and Bing Ads. It's nearly impossible to keep track of them all and definitely impossible to list them all here. Here's my shot at exploring the changes to both ad platforms in 2017. There's no doubt that 2016 was a monster year for AdWords (side ads were removed, cross targeting abilities added, etc.). Still, I feel that this year, though lacking in the way of a blockbuster update like removing every single side ad, was even more significant as advertisers got a lot of new "toys" to work with. 1) Automated Call Extensions: In early January, just as 2017 began to roll in, Google announced that it may automatically add a call extension to some mobile ads. Google said numbers are pulled from an ad's landing page, when the number is "prominent." In March, Google announced that this feature will be included in an increasing number of ads. 2) Price Extensions for All Devices: On March 1st, Google expanded its price extensions beyond mobile to all devices. 4) Extensions for Call Only Ads: Following March's global expansion of business name headers within call-only ads, Google gave advertisers using the format the ability to add extensions to the format in late September of 2017. 5) Local Extensions: Also a March 2017 addition, AdWords advertisers were treated to a new local extension. Here, an ad may include a map add-on that has some similarities to a mobile Local Knowledge Panel in that it includes the Call, Website, and Directions buttons. 6) Call Extension Bid Adjustments: Giving you a way to establish how often call information appears in mobile ads, the bid adjustment was just one of the new elements of the updated AdWords interface that rolled-out in 2017. 7) Promotion Extensions: Just as the 2017 holiday season was upon us, Google gave AdWords advertisers the gift of promotion extensions. In this way, advertisers could avoid creating and running all new ads to support their holiday sales. Instead, such advertisers could elect to add on a promotion extension to highlight any such special offers. 8) Interactive SiteLinks: The SiteLinks extension on mobile got a nice upgrade with a swipeable carousel. In doing so, Google has put a stop to the extension getting cut-off and users not being able to see the complete set of SiteLinks. Extensions aside, there were a series of quite significant changes made to AdWords in 2017. In fact, the year started off with the Ads for AdWords pilot, which has Google create variations of your ads for you, automatically (needless to say this caused quite the SEM ruckus). In the same month, Google launched the new AdWords IF functions. Essentially a new way to conduct ad targeting, the IF functionality allows ad creators to select parameters for when a specific ad version should show. Setting certain attributes, such as if a user is on mobile, is a new customer, or has previously abandoned their cart on your site, will enable you to show each user a specific ad variation. In another winter update, Google again changed the AdWords ad label. Previously an organic green background with white letters, in February the label was inversed. Now, the AdWords label consists of a white background (thereby matching the very SERP itself) that makes use of organic green lettering. 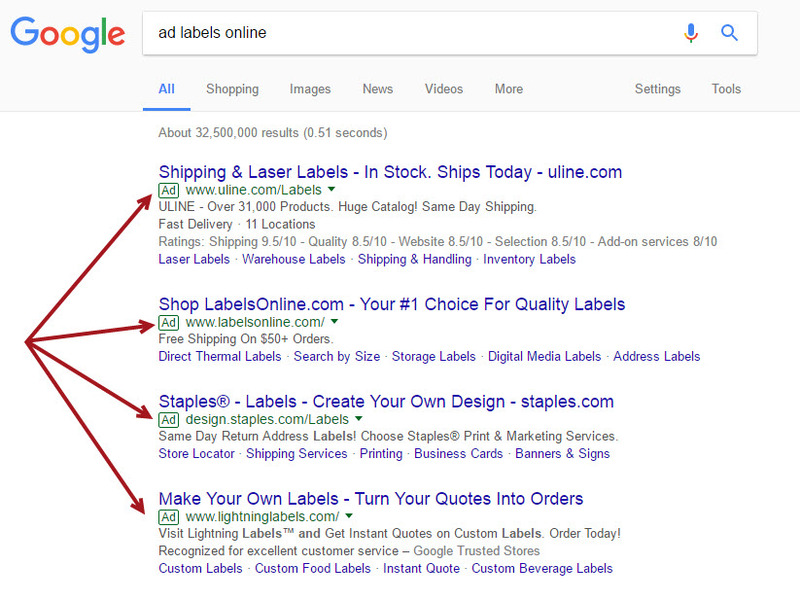 The obvious speculation being that Google wanted the ad label to be a whole lot more inconspicuous. The ad label was certainly not the biggest AdWords shakeup of 2017. That honor seems to belong to the announcement that AdWords may overspend your daily budget by twofold. The announcement for this one was quite ambiguous and left the industry both scratching its collective head and fuming to an extent. The early October change upped the overspend that previously stood at 20%, but only applies to a certain AdWords profile (i.e., those campaigns that run throughout the entire month). So in the end, it wasn't as bad as first thought. 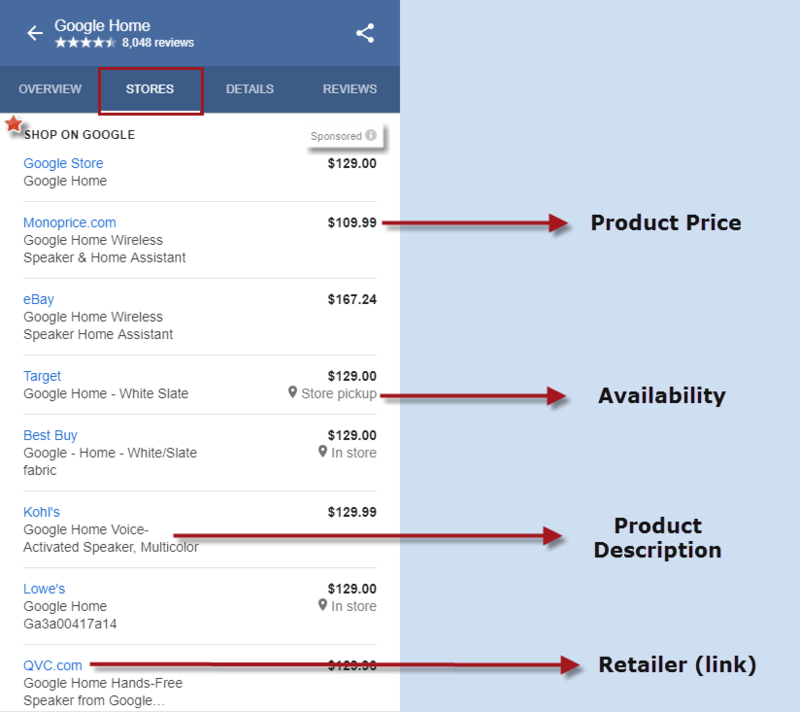 On top of that Google announced new store measurement abilities for AdWords. Now you can see how long it took a user to make their way to the store after that first initial click and how many store visits were made by new vs. returning customers. Last in this category was Google's December announcement that phone number and address lists could be uploaded into AdWords. Thus, advertisers who don't have an extensive email list, now have more options for Google Customer Match ad targeting. 2017 was a stellar year for Google's Home Service ads. First, the ad format, which focuses on home repair vendors that are guaranteed by Google, made its first appearance on America's East Coast (the ads were previously relegated to cities in California). On top of that, new vendor categories entered the fray. Whereas in the past only vendors such as plumbers and locksmiths could advertise, now painters, electricians, etc. display within Home Service Ads (which are not what they are called anymore, read on). Then, at the end of October, Google announced that 30 more cities would see the ad format by the end of 2017. With the expansion, Google also created an app so that advertisers could better oversee their ad campaigns. To top it all off, Google renamed the ads, Local Service Ads, as they had expanded beyond just home services and into areas like auto glass repair, etc. Some have speculated (cough, cough, myself and our SEO manager, Tzvi Barish) that the expansion of the re-branded Local Service Ads has to do with the Chrome ad blocker Google announced back in April. As Google will surely see PPC revenues decrease with the ad blocker, expanding the Local Service Ad format could be a way to compensate and bolster ad revenues. 2016 was in my mind a breakthrough year for Bing. They released what was just an onslaught of changes that forced the industry to give Bing Ads just a bit more attention. This trend, though to a lesser extent, continued in 2017 as Bing maintained a staunch focus on improving their ad platform. Bing began the year with their own ad extension upgrade by giving you the opportunity to show ad extensions at specific moments. Meaning, you could schedule your Bing ad extensions to show during specific hours of the day. Recognizing the reality of the paid search landscape, Bing, in early 2017, offered up the ability to have their AdWords imports update automatically. Meaning, Bing advertisers no longer need to remember to update their Bing Ads campaigns after making a change to their AdWords ads. Bing, which already offered an AdWords import, will do it for you automatically. Smart move. Starting the year off with a roar, Bing announced new retargeting options just a few days after its automatic AdWords import update. In a nutshell, Bing introduced new ways to prevent users who have met certain criteria (i.e., have already made a purchase, have already visited your site via a search ad, etc.) from seeing specific ads. In early September, Bing announced that they will help you determine effective bidding practices by presenting you with suggested bid adjustments. Again in September, Bing brought you the ability to import your offline conversions into their ad platform. The obvious idea is to give you a broader and more complete understanding of your Bing Ads performance. Along these lines, Bing also announced that you can import call conversions via the offline conversion import as well. Dynamic Search Ads gives Bing the leeway to determine the most relevant page on your site in relation to a user's search and then to generate an ad leading to that page. Bing will then generate an ad to match the user's intent and connect it to the URL they have previously identified as being the most relevant to the query. In this way, the ad type is similar to the Ad for AdWords pilot mentioned earlier. 2017 saw the Dynamic Search Ad make their way onto the Bing SERP in the US and UK. Each and every year there are endless changes made to the Google SERP and the SERP features that reside on it. Any given month can see test after test to SERP features such as the Local Pack, Knowledge Panel, etc. Sometimes these tests turn into permanent SERP feature fixtures, sometimes not. There is no way to go through each and every SERP feature test, change, or upgrade, and nor would we even want to. However, there were quite a few serious SERP feature shake-ups in 2017, leaving us no shortage of material to work through. Google loves its Knowledge Panel as the SERP feature is the constant recipient of new elements that make it all the more powerful. Interestingly, in 2017 a of lot these changes either impacted Google's bottom line or your own. The Knowledge Panel for hotels is a potent money earner for Google. With booking sites paying for ad space and the hotels themselves having their own arrangement with Google, these panels, while informative, are also a money earner for Google. Which may explain why such panels saw an entire overhaul of their rating system on mobile. 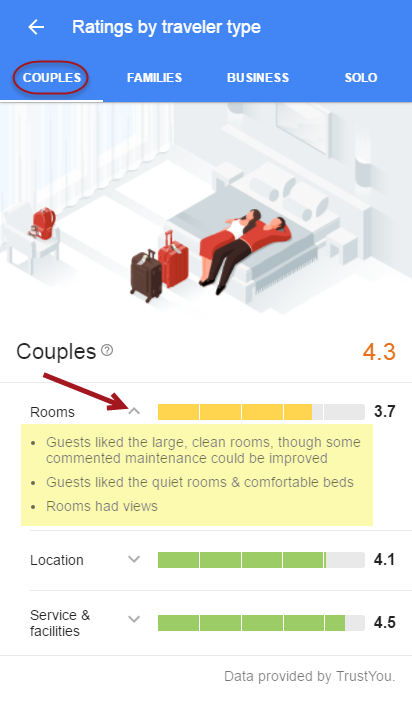 In 2017, Google segmented its hotel ratings within the mobile Knowledge Panel by the type of guest (i.e., a family, a couple, etc.). More, the ratings are then further segmented by room, location, and services/facilities ratings. The new in-panel hotel rating format on mobile is a visually appealing and highly informative system that is sure to help ease the booking process along. On top of this, Google introduced an entirely new way to research hotel prices within the Knowledge Panel. 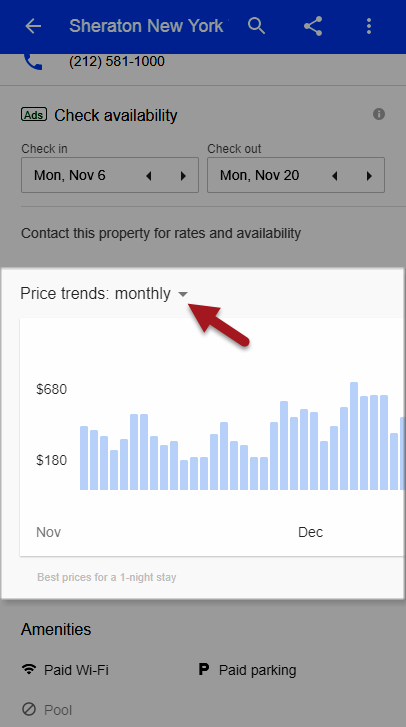 As part of its upgrade, you can now utilize a calendar that shows you the best rate on any given day, access a price trends graph, etc. Since we're on the topic already, with the hotel Knowledge Panel upgrade came a similar overhaul to the Flight Box. 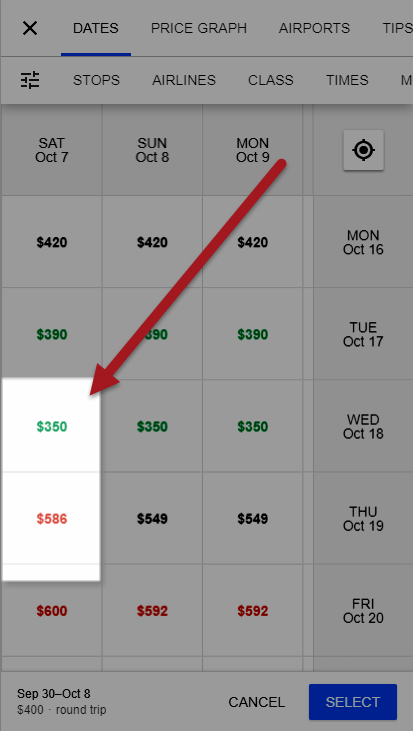 Like the new upgrade to hotel price searching options in the Knowledge Panel, the Flight Box saw a similar price trends graph and a comprehensive new way to track down the cheapest flights that includes a dynamic pricing calendar with numerous filters, the ability to select which airports to include in the search, etc. The new price search features for both hotels and flights suggested a new in-feature revenue strategy for Google in 2017 (and beyond). 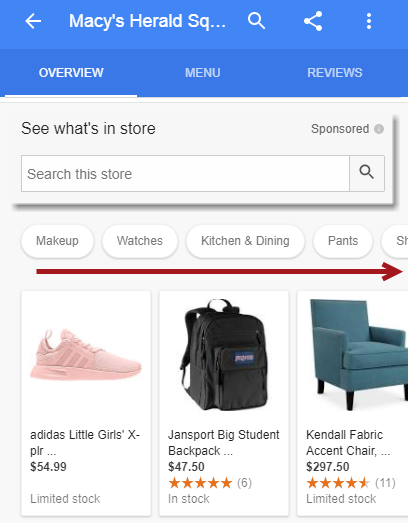 For retailers that appeared in a Knowledge Panel, Google used to show a link to a Google page filled with products (part of the Local Inventory Ad program). No more! Now you get an image-centric set of product listings along with a search box, with which you can search for a product to see if it is offered by the store (and via the Local Inventory Ad program). That was not the only change for products within the Knowledge Panel in 2017. Google released an upgraded Product Knowledge Panel behemoth shortly before Black Friday and Cyber Monday kicked off. The panel, which is surely meant to claim some product search ground (from Amazon), is a one-stop product research shop that could quite easily (and seamlessly) segue into a Google Shopping conversion. 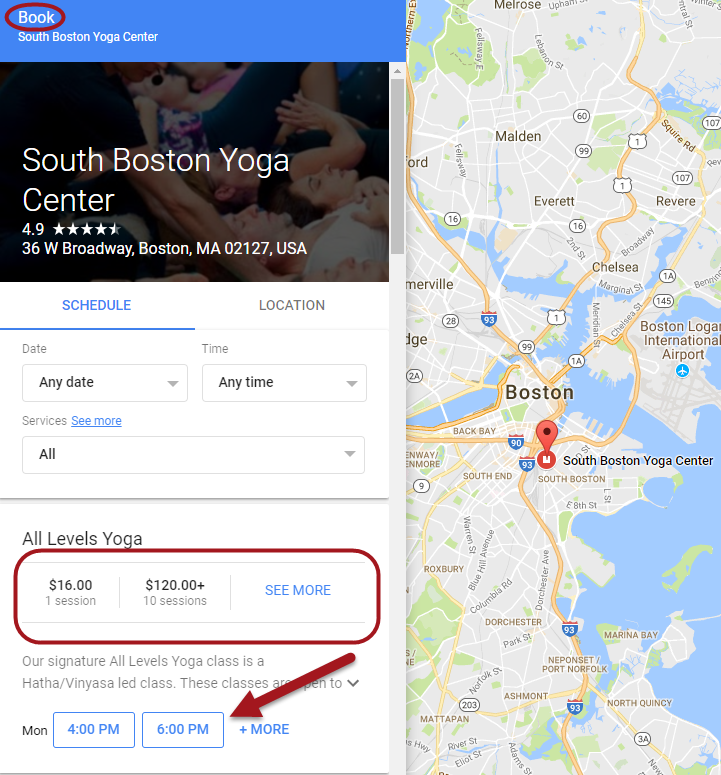 At the end of August Google began running a Book button within Knowledge Panels related to select yoga studios. The button enabled you to book an appointment at a studio via the Knowledge Panel. Then, in late October, Google expanded the booking option to more businesses via an integration with any one of its "scheduling partners." 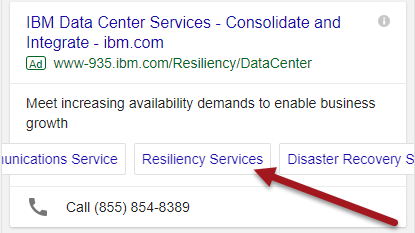 The obvious revenue implication is that a user can now in theory book an appointment without ever leaving the SERP or without ever picking up the phone. In July, Google released a messaging aspect to Google My Business that enabled business owners to set up direct customer messaging via a Local Knowledge Panel. Meaning, you can now initiate a conversation with a business via the Knowledge Panel. What's more is that Google also indicates how long a business takes to reply to its messages, which of course could either help or hinder your profit earning (depending on how timely your responses are). 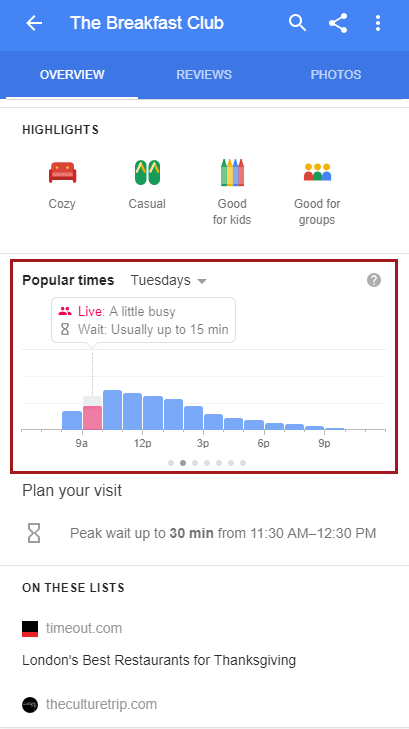 Google has been showing both live and estimated wait times within the Knowledge Panel for various establishments (i.e., retail stores) for some time. However, in November Google expanded this functionality to restaurants. Now you can see either an estimated or live wait time at a given eatery. With the feature, restaurants will surely need to keep an eye on their wait times as customers are likely to avoid an establishment that will likely delay their culinary cravings. Showing up in August within mobile Knowledge Panels, Google released a new Q&A section that allows business owners to develop what is all but an in-panel FAQ. Of course, users can also ask and answer questions related to a business. The feature was added to desktop in December as well. In a sense, the feature could function like a review, highlighting previous customer experiences. That is, you would want to ensure that your business offers a quality service/product so that when one user asks a question and another user answers it, the connotation of that answer is positive. Beyond those Knowledge Panels that pack a fiscal punch, there were some interesting changes made to Google's on-SERP information center. For example, in September Google updated its mobile Movie Knowledge Panels. These Knowledge Panels used to result in an organic result abolition when expanded. Now, the panel utilizes tabs (as opposed to an expansion button) and incorporates organic results. However, the potency of these organic results comes into question as the information contained within the Knowledge Panel portion of the SERP all but makes them irrelevant. Also new to the SERP in 2017 were Publisher Panels. In an effort to combat fake news, Google created a Knowledge Panel showcasing news publishers. The panels contain anything from awards the publisher has won to the contested content they have published in the past. This comes in addition to Google's fake news offensive known as Project Owl, which was initiated at the end of April, but appears to be having mixed results. Google put a lot of development into the Google Posts SERP feature in 2017. The question is, will it pay off, or will the feature go relatively unused? Either way, Google Posts has come a long way in 2017. In February the SERP content feature became GIF ready. 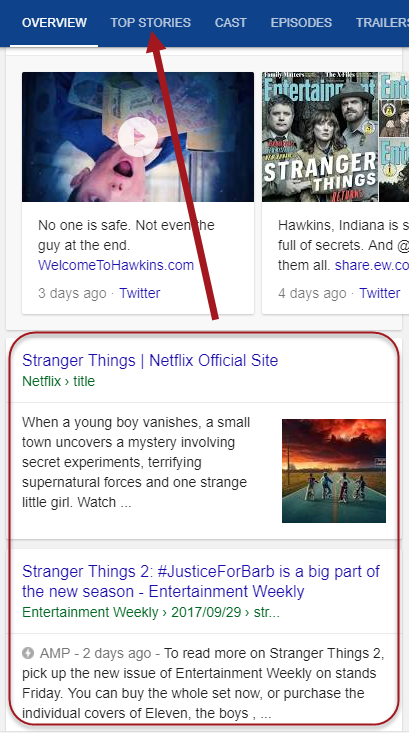 Meaning, you could show a GIF right on the SERP within your Google Posts. 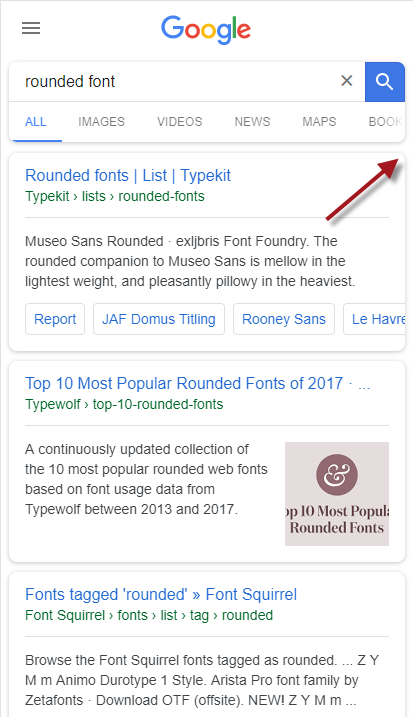 Shortly after this animated addition, Google announced that the SERP feature would include more content categories, thereby expanding the SERP presence of Google Posts. A few months later, Google gave business owners the gift of Google Posts, allowing them to post content directly to their Local Panels via Google My Business. To cap it all off, in October Google Posts were added to the Google My Business API. Meaning, you can now create automated posts much like many of us do with Twitter or Facebook via platforms like Hootsuite, et al. 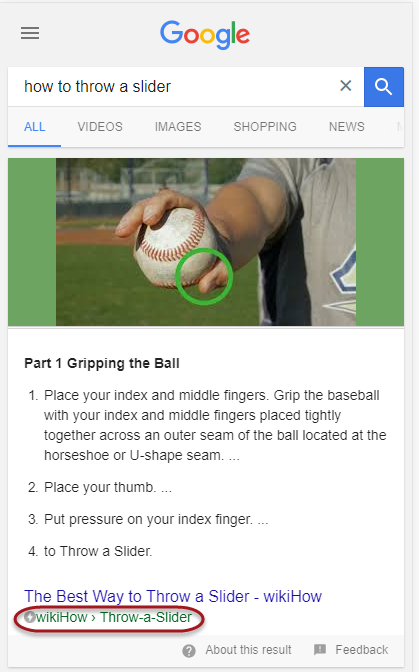 To me, this is the moment of truth for Google Posts. Will these platforms pick up the API, allowing their users to create automated Google Posts. If not, the SERP feature may face obscurity. Certainly there were more SERP changes than those made to the Knowledge Panel and Google Posts? But of course! Typical of any year on the Google SERP there were a diverse set of upgrades and updates. One of the biggest stories on the SERP this past year was Google's new jobs feature (appropriately titled Google for Jobs). 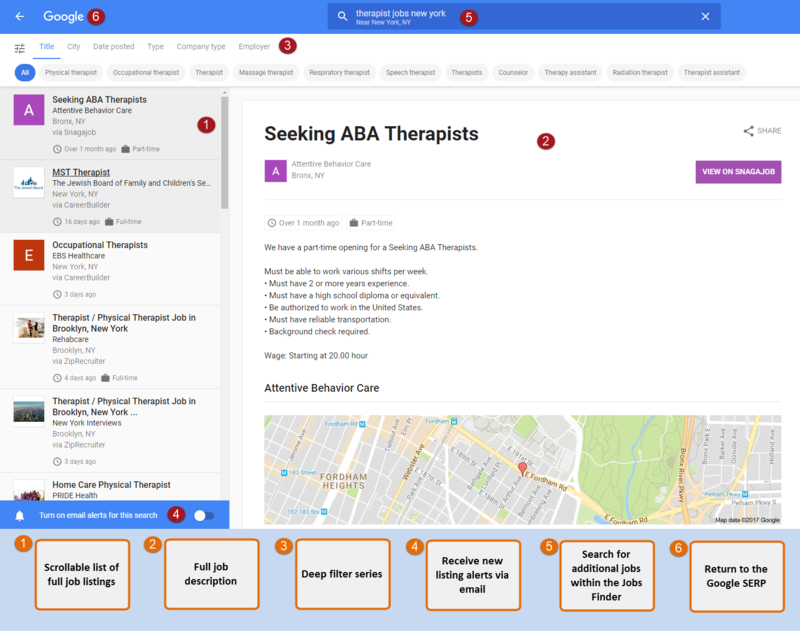 Making its way onto the SERP in April, Google's new jobs feature is a force to be reckoned with as it dominates those SERPs that appear in connection to job queries and overshadows the organic results. In February Google changed the way the People Also Ask SERP feature (aka Related Questions) appears on the SERP. Previously a finite number of expandable boxes, Google morphed the featured into a dynamically loading and all but infinite series of questions that evolves as you expand new answers. Towards the end of November our SERP Features Tool caught an unprecedented increase in the length of meta-descriptions appearing within organic results on the Google SERP. Specifically, we saw the average number of characters within these descriptions jump from roughly 165 to approximately 225. As December rolled in, Google confirmed the increase to be part of a purposeful roll-out (i.e., it was not a bug or a test). Two big changes in 2017 to the way the mobile SERP looks/functions. First, the mobile SERP got a new Google homepage in the US. 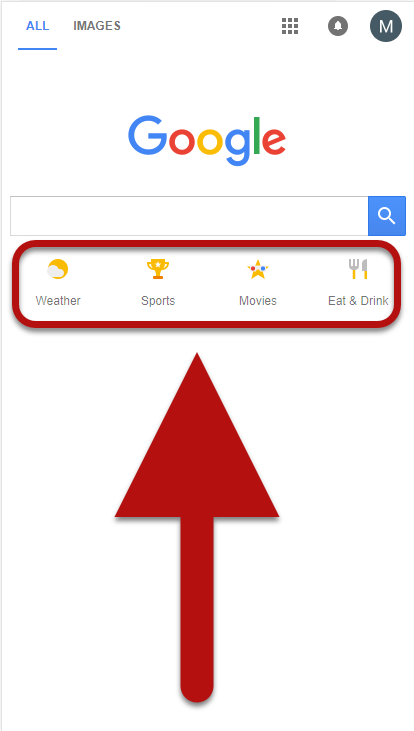 Now, four icons appear (Weather, Sports, Entertainment, and Eat & Drink) that take you to custom-fit results (based on your search history, etc.). Secondly, and after a long testing period, Google finally went with the rounded card result format on mobile. Like it sounds, organic results on the mobile SERP appear within cards that contain rounded edges. Google Finance has morphed into a tab on the SERP. Like the tab for news and images, all of your Google Finance content is now located under the tab Finance which appears right on the SERP. Meaning, you no longer need to go to the Google Finance site in order to access your data. So long as you're logged into your Google account, the Finance tab will display all of your finance information. It used to be that sites offering news content via a subscription would offer limited free access from the SERP, or face lower rankings. All of that has changed as Google works to reconcile with publishers looking to increase their subscription revenue. With the shuttering of the First Click Free program, instead of demanding a minimum of free content from publishers, the news outlets themselves will decide how many free articles to show a user per day. Also, Google says it will prominently show a user news from sources they already subscribe to. In March, DMOZ (the Open Directory Project) closed its doors. Accordingly, and with the web directory shuttered, Google announced that they would no longer use DMOZ titles and descriptions within its results, as they sometimes did previously. With so many changes to every aspect of the SEO/SEM industry, it's hard to pin down a set of patterns. Of course, yes, there is a hyper-focus on mobile. From more and more AMP proliferation to the mobile-first index, mobile is major. Looking past that for a moment, I just have this sense that Google's turned the corner when it comes to its SERP features. In years past, the SERP feature air was filled with improved user experience and providing Google with prominence on their own SERP. In 2017 the winds of change were at work and when all things were said and done I get the sense that SERP features are now about user experience and both your and Google's bottom line. So while you might hear that Featured Snippets are the future of the SERP and that everything you do should revolve around them, I just don't buy into that narrative. I predict that 2018 will not be about Featured Snippets, but Knowledge Panels, Local Finders, and structured data SERP features like Google for Jobs. Think about what Google for Jobs has done to the significance of a job listing site's organic rankings. Now imagine a good 3 - 4 other such SERP features. We've already seen Google dip their hand into a business's revenue with the Knowledge Panel booking button. My money is on this pattern continuing to the extent where Google expands SERP feature elements like the booking button, and goes deeper in terms of its monetary significance. With everyone distracted by Featured Snippets, this author thinks Google will make its play with other SERP features. Until then, thanks for reading and see you around the SERP.